The Confederation of African Football (CAF)’s Women’s Player of the Year, Thembi Kgatlana, returned to her former school, AB Phokompe Secondary School in Randfontein for the first time since receiving her awards in January. She was accompanied by her new sponsor, La Liga, and together they launched a new partnership. 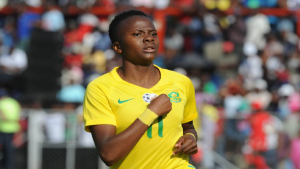 Kgatlana will join Banyana Banyana later this week to start with preparations for the Cyprus Cup tournament. Kgatlana did not only get the nod for the top women’s player award on the continent in Dakar, Senegal. Her goal against Nigeria during the Africa Women’s Cup of Nations was also voted the best of the year. She arrived at her former school to give a motivational talk and donate playing equipment to the school. It was an honour for the learners to share a moment with Banyana Banyana’s star player. They were also left inspired by her talk. “She was telling us to believe in ourselves and love what we do so that we can be successful one day,” says one player. “We are inspired because of the things that she spoke to us. We now understand why education is important,” says another. La Liga will sponsor the Thembi Kgatlana Tournament later in 2019. The tournament features both men and women’s categories. La Liga’s Enrique Suay says that Kgatlana’s project is special. Kgatlana, who left Houston Dash after just a season in the USA’s National Women’s League, stayed mum on her next move. However, indications are that she will be signing for a club in the Far East. The post Thembi Kgatlana returns to former school to give back appeared first on SABC News – Breaking news, special reports, world, business, sport coverage of all South African current events. Africa's news leader..